Levon Parikian’s first musical influence was his father, the renowned violinist Manoug Parikian, whose musicianship and experience as soloist, chamber musician and orchestral leader instilled in Levon from an early age a deep appreciation of the tradition of musical performance. While studying timpani and percussion at the Royal Academy of Music, Levon developed his interest in conducting, and subsequently studied privately with Michael Rose and David Parry. Following further study with George Hurst, and at his encouragement, Levon auditioned successfully for a position in Ilya Musin’s class at the St. Petersburg conservatoire. Here he gained an insight into Musin’s rigorous technique of conducting, which has influenced generations of Russian conductors. Since his return from Russia, Levon has pursued a freelance conducting career, and is much in demand as Guest Conductor with orchestras in Britain. 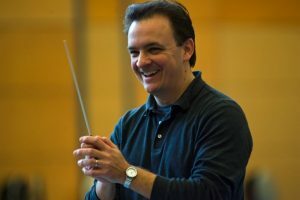 He currently holds Principal Conductor posts with several London-based orchestras, is Principal Conductor of the City of Oxford Orchestra, and Artistic Director of The Rehearsal Orchestra. He is also very committed to training young musicians and has worked extensively with students and youth orchestras, including the Hertfordshire County Youth Orchestra, National Youth Strings Academy, Royal College of Music Junior Sinfonia, and at Royal Holloway, University of London, where he also teaches conducting. He recently conducted the BBC Concert Orchestra in a re-recording of the theme tune for Hancock’s Half Hour, lost episodes of which were broadcast last autumn on Radio 4. Lev is also a writer. His first book Waving, Not Drowning, was described as “a must-read” by Classical Music magazine, and as “mercifully short” by Lev himself. His second book, a tale of woeful ornithology entitled Why Do Birds Suddenly Disappear? is currently crowdfunding at unbound.co.uk and will be published in the second half of 2017. Levon Parikian has been our Musical Director since 2000. The rest of us come from diverse backgrounds: students, teachers, architects, artists, engineers, accountants and many more. We have several music college graduates and players from around the world: France, The Netherlands, Germany, Japan and the USA. One of our former violinists, Chonon Lewis, is an accomplished composer, and we have performed his works on several occasions. Some of us have been in the orchestra for years, some have joined much more recently. The age range is wide and there are plenty of young members. Many of us live in the North London area, but a significant number travel in from other parts of London and from much further afield. What we all have in common is that we are passionate about music and our orchestra. As well as playing music together, we enjoy a very strong social scene which includes post-rehearsal drinks and regular nights out. This orchestra is affiliated to Making Music which represents and supports amateur choirs, orchestras and music promoters.